The site for everything concrete pavers – brands, reviews, prices, cost, installation, contractors, and information! This section of the site will list out the many different types, styles, and brands of pavers and paving stones that you can purchase and use. Click on the following blue links to access these articles. Come back often for newer articles. If you’d like to see the newest posts in this section, scroll down. One of the benefit of concrete pavers is that they come in many shapes, sizes, and colors. This allows you to come up with many different paver designs for your next driveway, walkway, patio, pool deck, or garden/landscape project. This is opposed to slab options like concrete and asphalt, which are relatively limited in the designs you can choose for the material. This variety is definitely a positive – the only problem is that you may also be overwhelmed by all this choice. Of course, you could rely on the suggestions and advice of your contractor, but you may also want to be educated on the options available to you – and this is what this article is for. This will also be very useful for you if you are embarking on a DIY concrete pavers project. The most common shape of paver is the Holland stone. It is 6 inches by 9 inches and can be used to create many paver patterns. Another common size of paver is the 6″ x 6″ square. These can be used by themselves or in conjunction with another brick size, such as the 6 x 9, to make a even wider variety of patterns. For most, if not all, projects, you can’t go wrong with the standard 6 x 9 and 6 x 6 pavers. However, there are also other shapes out there that may useful for you to look into using. For instance, one popular paver shape is the ‘stop sign’ or octagon. One example of these are Unilock’s stop sign pavers. These don’t offer you many different pattern options, as they must be laid just so, but many enjoy the ease of installation and classic look of the material. Choosing the right paver shape and size for your depends on a few factors. The most important one is your own tastes and style. In addition, the shape you select will have an impact on the patterns you can do, so if you’re looking for a particular pattern, you will be more limited in the shapes you select. On a related note, certain project types, like walkways and stoops, and certain dimensions of projects require certain shapes and patterns. Thus, you’ll want to check with a professional to make sure that you’re picking a shape, size, and pattern appropriate for the job. Don’t forget that you can also mix shapes and sizes together to form an almost limitless amount of patterns and designs. Finally, some brands have ‘irregular’ shaped pavers and slabs – this can be a quite interesting and unique pattern to lay in your yard, but know that laying this irregular pattern properly may take some skill and shouldn’t be attempted by DIYers. There are many different pavers shapes and paver sizes available from different manufacturers. Some examples are listed below. Check with the manufacturer for more information and for local availability. Keep in mind that the paver shape and paver size you select have a profound impact on your intended design, and vice versa. Note that at this point we are just evaluating the pavers available from one company, Nicolock, but in the future we will discuss more. Note, however, that Nicolock’s selection is a good sub for the selections of most paver companies, so at least you’ll get a solid idea of the types available. Holland Stone: 200mm x 100mm (7 13/16” x 3-7/8”). 1 Bundle is 120 sq. ft (540 brick). These are basically rectangular brick, and one of the most popular sizes of concrete paving stones. There are many different patterns that can be created by using Holland Stone, with or without borders. Cobblestone: Fullstone, 222mm x 157mm, 8-13/16” x 6-3/16”. 1 Bundle is 111 sq. ft (400 brick); Edgestone, same as above except 500 brick. Circles and Fans: Large circle stone, 80mm x 120 mm, 3-1/8” x 4-3/4”, 360/bundle; center stone, 118 mm, 4-5/8”, 9/bundle; ¾ normal stone 90mm x 120mm, 3-9/16”x4-3/4”, 288/bundle; small circle stone 50mm x 120mm 2” x 4-3/4”, 27/bundle. Amount of stones needed for circles depends on the layout of the job, size of circle (in layers), etc. Colonial Cobble Circle: Large wedge, center stone, small wedge, small rectangle, medium rectangle. One of the major benefits of concrete pavers is that they come in a wide variety of colors. This is in direct contrast to materials like poured concrete and asphalt, which typically come in one color (unless special coloring is added before they are laid). With this burst of color, you can do much more with your design than you would with the typical greys and blacks of slab materials. For instance, you can match your hardscape to your landscape or to the color palette of your home. Many homeowners fret over picking the right color. Note that there’s not going to be one ‘right’ choice out of a bunch of ‘wrong’ choices – many different blends of brick will work with your project, so pick the one that YOU like the most or that your contractor recommends. Of course, the colors you pick for your new project, whether driveway, walkway, patio, pool deck, garden, or other application, mostly depend on your taste. Some colors will go well with any environment, especially naturals and neutrals like grey, black, brown, and beige. However, sometimes certain colors will go best with your already existing home style, landscape, and other hardscape projects. This includes reds, oranges, yellows, and pastel colors – these colors can really draw the eye and look great given the right environment, as they can easily clash with other aspects of your home and yard. Another thing to keep in mind is how the color affects the way the area looks. Lighter colors will generally make a project look larger, while darker colors will make it look smaller. In addition, single color pavers usually show stains much more easily, while blends will hide stains better. However, note that there are plenty of ways to remove stains and clean pavers, so don’t worry about this that much. Another thing to keep in mind is the heat that may be generated by the pavers you select. If people will be walking on the surface of the pavers with bare feet, it will be best if you take a lighter looking paver. For instance, you will want to go with a lighter color for a pool deck project or a patio versus a driveway. Driveways, in general, are better with darker colors, as this color will hide stains and marks better than a lighter color. An important note: pavers even within the same colors may differ from order to order. Thus, if you want to use the same color pavers for different projects, its probably best to have those projects completed at the same time to ensure that you won’t have major differences in color between different areas – this is completed by mixing the pallets together as much as possible. You (or whoever is doing the installation) should be sure to take brick from different parts of each pallet and from different pallets at once to ensure an even distribution of the brick. In general pavers come in different blends of colors. The most popular are two color blends. This can either mean two bricks of an entirely different color each (for instance, one red and another gold). More commonly, however, this means a set of bricks where the two colors exist in varying quantities. For instance, one brick may contain almost all of Color A, while another can contain almost all Color B, and where other bricks may contain mixtures of A and B at varying amounts. There are many different paver color blends available from many different concrete paver manufacturers, so an exhaustive list isn’t possible at this point. Please check with your selected manufacturer to determine both paving stone colors selection and availability. 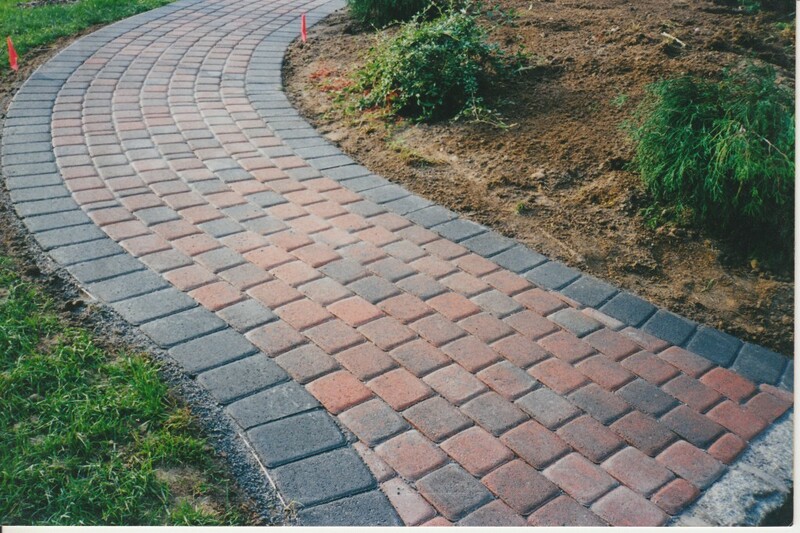 (Some paver colors and shapes require manufacturing time as they aren’t kept in stock). Two color blends – some of the most popular concrete paver colors. When installing these bricks, the color should be ‘randomized’ as much as is possible. This requires the installer to not take from the top of a single pallet of concrete pavers down through each layer. Instead, the installer should work from multiple pallets at the same time, and work through entire sections. This is to ensure concrete paver color variability throughout the finished product. Examples of two pavers colors blends include Nicolock’s granite city blend, terra cotta blend, golden brown blend, harvest gold blend, fire island blend, adobe blend, cocoa blend, autumn blend, marble blend, crab orchard blend, bayberry blend, oyster blend, sahara blend, mocha blend, and sage blend; Grinnell’s hickory, buckskin, chestnut, brown flash, gray flash, and multicolor; Camrbidge’s Ruby/Onyx, Sahara/Chestnut, Chestnut/Salmon, Onyx/Natural, Salmon/Onyx, Onyx/Chestnut, Golden/Onyx, Canyon Blend, Toffee/Onyx, Chestnut/Bronze; and Rinox’s Ash Charcoal, Burgundy Wine, Morocco Beige, Ivory Beige, Milton Grey, and Panama Beige. Note as well that three color blends also do exist, but they are rarer than the ones described above. They are also more difficult to work with, as keeping an even distribution of the color throughout the project can be a challenge. In addition, minimum size requirements for projects with three-color blends are required to allow for proper mixtures of colors. Note that it is possible to mix colors of different blends together. 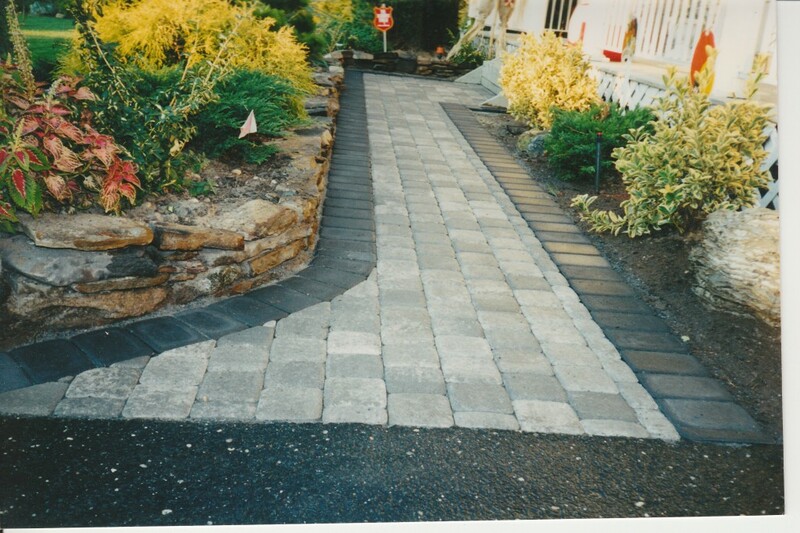 This is done most often with single colors as the paver pattern or paver design requires. For example, many like to use standard grey brick for the major part of the patio or driveway with a darker border used as a soldier course. However, mixing more than three colors may lead to a very confusing and messy installation. Thus, it’s best to stick with the blends that the manufacturers have provided. Preserving the color over time is an important aspect of this choice to consider. The best way to do this is to pick a paver that will not fade due to the sun or to rain; in addition, pavers near pools must be able to withstand the effects of chlorinated water. Another way to preserve or heighten the effect of the colors of your brick is to seal the pavers every year or two. This will give them the ‘wet’ look that makes their colors pop from the landscape. When making any decision on color or style, while pictures are an important resource, decisions should not be made based on images alone. Consult several samples of the actual pavers in order to get a better idea of the range of color and the quality of the paving stone. Furthermore, paver colors can vary somewhat from pallet to pallet. In addition, depending on the square footage, certain color patterns (particularly those with three or more colors) will not work, because the project’s not big enough to get an even blend of the colors. Note that there are other types of pavers out there besides the regular kind that you normally see. For instance, tumbled brick give the pavers a weathered, aged look that may look great in certain applications. The types of paver available and their styles will depend on the manufacturer, obviously, which is why it pays to cast a wide net if you’re looking for something unique. In what follows, we’ll give you a run down of the some of the pavers we’re familiar with in actually working with them. We’ll give you a brief description of the company, the kinds of pavers they make, and the relative quality. Note that most pavers are pretty much the same, as there are usually few differences between bricks. The most major difference between pavers is the consistency of the brick within the pallet, both in terms of sizes, colors, and shapes. The more consistent, the easier they are to lay and the better the final product will turn out. When you pay more for pavers, you are usually paying more for this consistency, as well as for finer colors, hardier brick, and more design options, as well as the ‘quality’ inherent in a brand name…if you believe in that sort of thing, that is. Of course, going with the recommendations of your contractor is never a bad bet, either. A division of Nicolia Concrete Products, Nicolock Pavers has been around for over 50 years, and besides pavers produces precast concrete products and retaining wall systems. They are located primarily in Lindenhurst, NY, but have other branches in Newark, NJ, Northhaven, CT, and Frederick, MD. Nicolock’s pavers, according to their website, are made in the “most advanced paving production facilities in the world.” They are a third stronger than what is required for concrete paving stones. They heavily advertise their “Paver-Shield” products, claiming that their stones have smooth finishes and color all the way through the brick, unlike some competitors. They offer a lifetime warranty. Nicolock offers a number of products: Camelback and Stone Ridge pavers, the Serafina, Verona, and Trinity walls systems, along with many different types and colors of Paver-Shield pavers. Nicolock is a solid brand, though as with any pavers, quality can sometimes vary within a pallet. Based in New Jersey, this company has been manufacturing concrete pavers for a long time. They are one of the only paving stone firms that still mines its own materials. They thus have quality control over the whole process: from mine to your home. They claim that, “Our pride comes from making the home you keep beautiful even more beautiful. Beauty that comes not just from how something looks, but also from how it feels, invites, engages and encourages people to linger just a little bit longer.” They offer a lifetime warranty on their pavers. Like Nicolock’s Paver-Shield, Grinnell’s stones have “color-through” technology, ensuring color throughout the stone and for its lifetime. They offer traditional, vintage, and permeable pavers, as well as traditional and vintage wall stones. This is a quality paver. Located in Pennsylvania and Quebec, Canada, Rinox is a relative newcomer to the stone, in business for over 10 years. Rinox markets its products as the most “natural” looking available. They too offer a limited lifetime warranty. Rinox sells Antique, RinoCast, and Patio pavers, as well as standard and antique retaining walls. About their products, they say: “It’s the elegance and opulence of natural stone without the installation and maintenance hassles — the perfect marriage of form and function guaranteed to turn heads and last a lifetime.” Rinox is a great paver. Based in New York, Cambridge claims to have sold and installed over one billion pavers. They push hard on their ArmorTec technology. Color is not through the entire paver; instead, they concentrate the color on the surface, keeping the pavers new and colorful throughout their lifetimes (for which they offer a limited warranty). In response to competitors’ statements, they write, “Some other paver brands want you to think that the greater amount of color throughout the paver, the better the paver. Now you know the truth… color is not needed at all throughout the paver.” They offer many collections of pavingstones, including the Sherwood, Renaissance, KingsCourt, Excalibur, RoundTable, and Crusader collections, as well as wallstone systems. Nicolock and Cambridge seem to have a war of words concerning the amount of color used in the pavers. Nicolock has the color go through the paver, while Cambridge has only a super strong layer near the surface. They are both pretty much about the same and will last a long time, so don’t be sucked in by any particular lines of propaganda from these or any paver manufacturers. Some other brands of pavers that are also popular, but about which we don’t have much to say at this point (for now! ), include Unilock, Pavestone, Capitol Pavers, Belgard, Tiletech, Pacific Pavingstone, CST, Techno-Bloc, and EP Henry.